CAMBRIDGE, WI (Tuesday, September 4, 2018) It’s come down to this. Since late April, the teams and drivers have been working to put themselves in position to possibly take home a championship. Plenty of ups and downs have lead to early September and the end of the 2018 racing season is around the corner. As we head into Season Championship Night presented by Griffin Ford Lincoln of Fort Atkinson, there are battles that need to be settled. Several division titles are still up for grabs with only one more night of racing to determine the season champions. Lurking in third is Watertown’s John Ovadal Jr. Ovadal is fresh off his first feature win of the season and is looking to ride the wave of momentum into championship night. But he knows it’s going to be a tall task. “Well, to have a chance at the championship, a quick time and a feature win would be great! But with the level of competition I’m running against, it’s a long shot. I’ve done it before though, run hard and no mistakes and you never know!” The thought of acquiring a second title is something that drives Ovadal. “ Winning another championship would be like a dream come true. It’s been a long time since the first and it would almost be like a confirmation that I am a good racer. The guys that help me are not just crew guys, they are my best friends. They are like family to me, and giving them a gift like that would be amazing. It would justify all the hard work we’ve all done.” The battles on the track should be intense this Saturday night as we close out the 50th season of operation at Jefferson Speedway under Tucker Family ownership. In the Sportsman division, Watertown racer, Chris Chenoweth, owns a 101 point advantage over Jason Thoma of Jefferson. Chenoweth merely needs to take the green flag on Saturday night to wrap up his first Sportsman championship. Chenoweth has been consistent all season long, scoring five feature wins along the way. 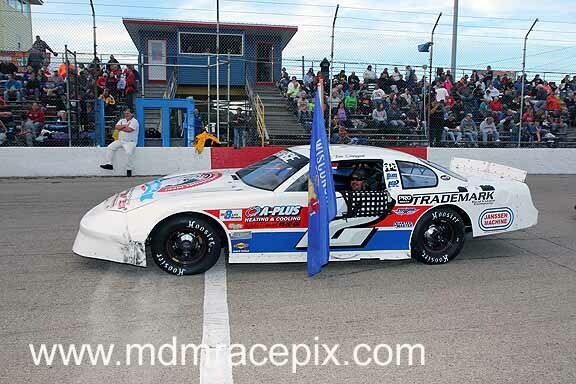 His feature win on the final night of the Badgerland Challenge Series, a four race event held between Jefferson Speedway and Madison International Speedway, helped give his home track the overall win in the series. 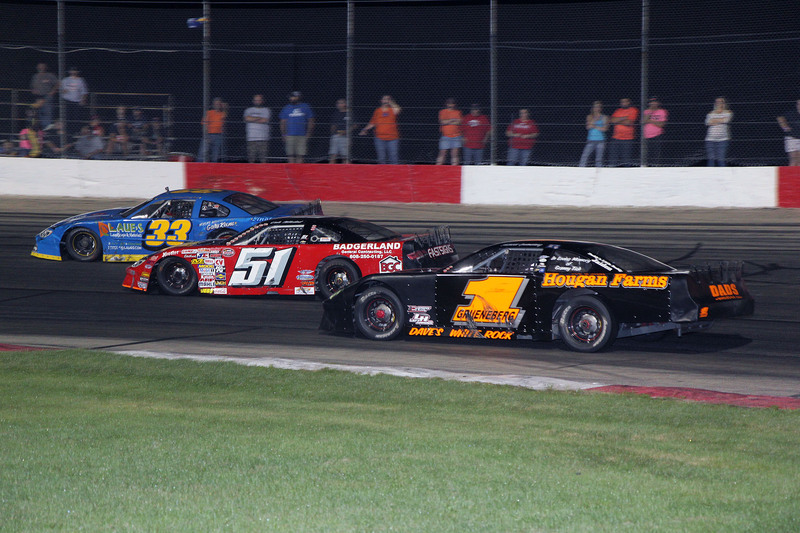 Chenoweth most recently captured the overall title in the Sportsman Challenge Series, a three night event held at Jefferson Speedway. Chenoweth already owns one title at Wisconsin’s Action Track, taking the International track championship in 2014. He appears poised to pick up his second division title in 2018. Lambert is trying to rebound from a season he’d rather forget in 2017. A hard wreck cut short his bid for a fourth title as well as a second back to back campaign. “After last year’s accident I knew I wanted to come back but I didn’t know how this year would go. My dad did everything he could to build me a winning car. Being able to come back and win a championship would mean a lot to me and my family,” stated Lambert. Yet another very close competition in the standings resides in the Hobby Stock class. Jim Tate Jr of Doylestown owns the top spot in the standings. Sitting in second, 17 points behind, is Beaver Dam’s Phillip Wuesthoff. Tate already has three Hobby Stock championships under his belt at Jefferson Speedway. Adding a fourth would be a welcome accomplishment. “We have had great success in the hobby stocks and sportsman classes, winning championships in both. At the end of the day we do it because we love it and will continue to work towards another in 2019,” exclaimed Tate. Wuesthoff has one championship in the Bandit division, but is in search of his first Hobby Stock crown. Waukesha’s Chester Williams remains in striking distance with Scott and Bud Riedner rounding out the top five. In Road Warrior action, Fort Atkinson’s Chris Gottschalk looks to put a bow on his fourth championship in the division including his third in a row. With a nearly 100 point advantage over Bill Sweeney, his chances look strong. Nick Schmidt of Watertown also holds an almost 100 point lead in the Bandit division standings as he looks to clinch his third title and his first since 2014. After the dust settles on Griffin Ford Lincoln of Fort Atkinson Championship Night, who will be standing tall as track champion? The best way to know is to get out to Wisconsin’s Action Track and see it unfold for yourself! All the action kicks off on Saturday, September 8, with time trials at 5pm and the first green flag of the night at 7pm. Jefferson Speedway is located halfway between Jefferson and Cambridge on Hwy 18. Please visit jeffersonspeedway.com for more information. Rookie Stevens earns victory at Jefferson Speedway!